Hitchhikers’ Guide to the Galaxy fans will remember the ultimate cocktail drink; the Pan Galactic Gargle Blaster. Imbibing this infectious blend was like being hit in the head by a slice of lemon wrapped around a large gold brick. But does the Pan Galactic Gargle Blaster remain the ultimate cocktail? I think I may have stumbled across something even stronger. The mass of people, as La Boetie and Mises recognised, always and everywhere consists of “brutes”, “dullards”, and “fools”, easily deluded and sunk into habitual submission. Thus today, inundated from early childhood with government propaganda in public schools and educational institutions by legions of publicly certified intellectuals, most people mindlessly accept and repeat nonsense such as that democracy is self-rule and government is of, by, and for the people. Hence, the decision by members of the [libertarian] elite to secede from and not cooperate with government must always include the resolve of engaging in, or contributing to, a continuous ideological struggle, for if the power of government rests on the widespread acceptance of false indeed absurd and foolish ideas, then the only genuine protection is the systematic attack of these ideas and the propagation and proliferation of true ones. Sounds like a great idea for a web site. As a result of subsidizing the malingerers, the neurotics, the careless, the alcoholics, the drug addicts, the Aids-infected, and the physically and mentally challenged through insurance regulation and compulsory health insurance, there will be more illness, malingering, neuroticism, carelessness, alcoholism, drug addiction, Aids infection, and physical and mental retardation. Crazy, dude. 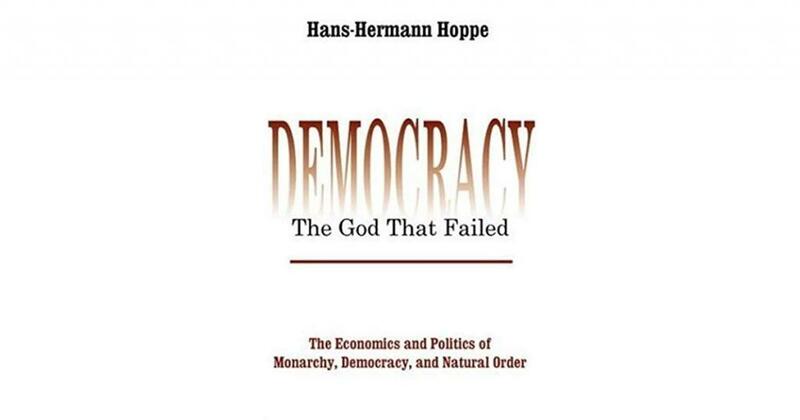 Hoppe’s book is subtitled ‘the economics and politics of monarchy, democracy, and natural order’. It is based on the premise that the privately-owned governments of the monarchical age, such as the Austro-Hungarian Empire, were bad, but far better than the publicly-owned governments of the democratic age, such as the United States of America. Having established this platform in the first third of the book, Hoppe then moves on to describe how government-free countries adopting the spontaneous natural order of liberty would be the best option of all, and how we could achieve this against the odds of worldwide statist malevolence. Given that libertarianism is clearly the best way of organising society, which will maximise the desired ends of everyone alive, and given that humans are clearly intelligent beings, most of whom have at least the potential to see this, even if they haven’t reached that point yet, why is the western world currently drowning in a swamp of welfare-dependency, increasing poverty, decivilisation, family break-up, graffiti, random violence, drugs culture, anti-social behaviour, fecklessness, and all the other evil stigmata associated with socialism? And furthermore, given that at least the United States of America, and possibly the United Kingdom, approached a near-Golden age of liberty over 200 years ago, which only started collapsing around the time of the First World War, what is it that is driving these virulent forces of socialism and neo-conservatism along, when all the evidence around us shows us clearly that collectivism is the worst thing that humanity has ever had the misfortune to stumble across? That the situation is only going to get worse is also apparent, but still we sleepwalk on into the socialist super states of NAFTA and the EU, and their eventual combined world government, muttering the mantra ‘More Government, More Government, More Government’. Nothing seems capable of halting this ‘inevitable’ steamroller. Why? Hoppe thinks he has the answer: Democracy. Its growth in the western world is linked directly to the growth of socialism and Big Government. Hoppe wonders whether this is coincidental or causal? We’ve been living in a dream world, he says. All this time we thought democracy and its associated documents, such as the Magna Carta and the American Constitution, were our salvation from the demagoguery of rogue government, but all along democracy has just been a longer chain to wrap us up in, another way of persuading us that Big Brother, Uncle Sam and Aunty Nanny State always knew best. Hoppe’s essential argument is that when a monarchical king owned a territory, over which he possessed a governmental monopoly of tax and judgement, he passed it on to his heirs with some amount of farsightedness. He always tried to preserve his state’s capital value. Although he also tried to raise revenue from this monopoly of power, and pushed this to the limit, the population around him always knew who their enemy was, the king, and restrained him accordingly. Thus, taxes never rose above eight per cent, and in most cases rarely got above five per cent. In the centuries-long battles between the City of London and the English King in Westminster, it was often the king who came off worst. And because the king was also chosen at random, through inheritance, and could only come from a small in-bred royal family, the general population never entertained the idea of entering government themselves. It was therefore always something outside of their experience, or possible future experience, so they always tried to restrain it. Quite successfully, for the most part. But this attitude changed with democracy. Now anyone could enter government and become the caretaker-king (or president). But the caretaker-king could not pass on the capital wealth of his country onto his heirs. He could be replaced in the publicly-owned government by anyone else at almost any time. However, he did have temporary control of his country’s resources. Therefore it made sense to forget capital values and to concentrate on revenues, something the caretaker-king did own. Hence taxes rose in direct proportion to the amount of democracy in a country, all the better to buy off the voters with their own money at the next election, to maintain the current caretaker-king’s power. Democracy also kicked out the second prop against rising taxes. Because now anyone could entertain the idea of being caretaker-king. This meant less people of intellectual substance opposed the rising confiscatory power of the government, for they too could foresee a future in which they themselves took up the caretaker-king’s Ring of Power. An alluring prospect, as any Tolkienesque wizard will tell you. Add to this the selfish mooch process, where we all abuse our majority democratic voting powers to force other people to give us their possessions, and the democratic rollercoaster whizzes down to the present age, with its inflated paper currencies, 40% taxes, and regulations covering every single tiny aspect of our lives right down to how much cardboard and plastic waste we have to put out for our garbage collectors. Given that in any aspect of life there will always be more ‘have-nots’ than ‘haves’, the ‘have-nots’ will always be in a terrorising majority, able to steal the goods and the services of the ‘haves’, in whichever sphere you choose, whether it’s in schools, health, or plain old redistributive taxation. That this will destroy the incentive to create the things worth having in the first place is forgotten, in our rush to steal from our neighbours, thereby breaking down society’s natural order and in turn creating decivilisation and higher time preference values where we all live for the moment. Why worry about the future? If we make anything, the government will take it from us. If we don’t make anything, the government will take stuff from those stupid enough to keep working and hand it on over to us. Whoopee! Live for the moment. Wealth consumed is wealth enjoyed. Let the devil take the hindmost. This lack of foresight thus encourages crime, hedonism, and self-destructive behaviour, because all the bad consequences which may follow from these acts occur only in an increasingly blurred future. As for criminals, they can see the increasing ineffectiveness of state monopolised justice, where more is spent and less is done, as in all monopolies. So steal away. It’s what the tax authorities do anyway, rob from the rich to give to the poor. I’m poor, so I’ll help myself. The chances of actually being caught and put away are minimal anyway, so what’s the worry? You can also add to this the government’s need to break apart the independence of the family and turn us into government dependants, to head off any strong familial resistance at the pass, hence social security, pensions, and ‘free’ healthcare and education systems. So why do families need each other now? They don’t. They only need the government. Pensioners don’t need children to support them in their old age, so the birth rate goes down; nobody needs to save, so capital investment goes down; children don’t even need their parents, so divorce rates rise, and so down the rabbit hole we go, Dorothy, all living on current income, often lifted from the pockets of other people. The government will take care of the future. Except of course we know the government doesn’t even have a clue about the next five minutes. Witness the scandalous borrowing of current world governments who haven’t a clue how all of this money is to be repaid. Oh well, we’ll worry about that after the next election. Look at that lovely hospital we’ve just built! The ML does not, unfortunately, hate the State because he sees it as the unique social instrument of organized aggression against person and property. Instead, the ML is an adolescent rebel against everyone around him: first, against his parents, second against his family, third against his neighbours, and finally against society itself…The ML’s modal occupation is computer programmer…Computers appeal indeed to the ML’s scientific and theoretical bent; but they also appeal to his aggravated nomadism, to his need not to have a regular payroll or regular abode…The ML also has the thousand-mile stare of the fanatic. As a former leftist-libertarian myself, accused occasionally of being a mad-staring-eyed lunatic, who makes his nomadic living from computing, I find this description rather too close to the knuckle. But it clearly demonstrates that Hoppe is opposed to the libertine aspects of libertarianism, preferring instead the idea of a world intolerant of deviation, based on family and kin, and spontaneously arising aristocratic elites, though elites which fail to assume the monopolies of taxation and jurisdiction typically associated with monarchy, but which fit more into the conservative idea of noblesse oblige. I think Robert Heinlein’s The Moon is a Harsh Mistress may be the best fictional guide to the natural family-based order Hoppe desires. It is also this return to a family-based welfare-independent community, which Hoppe uses to form the bridge between Austrian anarchic libertarianism and true natural order conservatism, two schools of thought he tries to link into one. The final third of Hoppe’s book rounds off his general argument for how we can throw off the yoke of publicly-owned government, and how to eliminate the errors of liberty, such as the belief that constitutions can effectively limit governments, a view Hoppe describes as utopian, with some choice words for Ayn Rand thrown in, just for fun. He particularly takes issue with the general pride of Americans. He states that they are right to be proud of their not-so-distant past as a land of pioneers, in an anarcho-capitalist order of natural liberty. He also thinks they should be proud of the American Revolution, where they threw off the yoke of European government, but that they are fundamentally flawed when it comes to being proud of the American Constitution. A sharp intake of breath, perhaps? This document was created by elitists whom most early American colonists knew nothing about. It cast in stone the idea that the government could legitimately tax its subjects and establish a monopolistic jurisdiction over them. This had never ever happened before, even in bad old Europe. Here kings had obviously taxed and judged their subjects, in their given territories, but this monopoly governmental right had never actually been legitimated. Only in America. And from that point on America was sunk. Because once you accept that a government has these two territorial monopolistic rights, of taxation and judgement, socialism is inevitable. It is only a question of time. Or in America’s case, about 200 years. So today we see people like Tony Blair swatting aside his opponents in the British Parliament, because given that government is a legitimate institution which has the legitimate right to tax everyone within its jurisdiction, parliamentarians of different parties are only arguing over the details as to which group of ‘have-nots’ is going to raid the property of which group of ‘haves’. And because Tony Blair has more charisma and is more immoral than any other crook in Parliament, he is the Prime Minister. End of story. If you believe in democracy. Given that the characteristics and talents required for political success – of good looks, sociability, oratorical power, charisma, etc. – are distributed unequally among men, then those with these particular characteristics and skills will have a sound advantage in the competition for scarce resources (economic success) as compared to those without them…Therefore entrance into and success within government will become increasingly impossible for anyone hampered by moral scruples against lying and stealing. Moreover, even outside the orbit of government, within civil society, individuals will increasingly rise to the top of economic and financial success not on account of their productive or entrepreneurial talents or even their superior defensive political talents, but rather because of their superior skills as unscrupulous political entrepreneurs and lobbyists. Thus, the Constitution virtually assures that exclusively dangerous men will rise to the pinnacle of government power and that moral behaviour and ethical standards will tend to decline and deteriorate all-around. So bang goes the American Constitution! Sorry. As for the unwritten British version, poor old Iain Duncan Smith! My kiss of death obviously failed to come soon enough. As to those men in civil society who’ve succeeded due to political machinations, rather than business ability, a few spring to mind. But none whom the libel laws of several continents will allow me to name. You may be able to fill in a few of your own. There can be no tolerance toward democrats and communists in a libertarian social order. They will have to be physically separated and expelled from society. Likewise, in a covenant founded for the purpose of protecting family and kin, there can be no tolerance toward those habitually promoting lifestyles incompatible with this goal. They – the advocates of alternative, non-family and kin-centred lifestyles such as, for instance, individual hedonism, parasitism, nature-environment worship, homosexuality, or communism – will have to be physically removed from society, too, if one is to maintain a libertarian order. Whoa, Baby! Professor Hoppe’s writings should certainly be avoided by the faint-hearted. Will these excluded people repent of their ways, see the benefits of conservative-libertarianism, and try to re-apply to Hoppe-World? Or will they form up into aggressive socialist states with nuclear-tipped missiles pointed at the Lichtensteins, Singapores, and all the other Hellenic-style cities which will make up the Hopperite Libertarian Confederation? I’m unsure. Let’s hope the SAS Prudence Company operatives will take out these socialist leaders, in sufficiently well-targeted pre-retaliatory strikes, before they turn the rest of us over into a world government socialist hell. Hoppe concludes with a plan to get from where we are now, to the Libertarian Confederation outlined above. Given that America managed to secede from Britain, but that the southern states of America failed to secede from the northern ones, how are we to establish Hoppe’s vision of a world of independent privately-owned anarcho-capitalist territories? He acknowledges that it’s going to be tough. But thinks America may be our salvation again, this time via small territories gradually seceding to the point where they are virtually independent of the United States. They will then be much more successful than surrounding areas, which will then gradually follow their example until it can be seen that these micro-territories are the best way for everyone to go, creating a flood of anarcho-capitalism around the world. In particular, like frogs in hot water, we must be gradualist about this and fail to provoke central states into retaliatory action. It must be all over before they’re sufficiently roused to do anything about it. It seems the Free State Project has a lot riding on it. I wonder if Professor Hoppe is going to move from Nevada to New Hampshire? As to the book, itself, I would recommend that you think of it as being the fifth in a series, the first four being written by Uncle Murray; Man, Economy and State; Power and Market; The Ethics of Liberty and For a New Liberty. You might want to describe Hoppe’s book as the missing fifth volume. It is also written as a series of independent chapters. This made it heavy-going as a serial read, for many of the same ideas and passages are repeated multiple times, which often caused your humble reviewer to think he was on the wrong page. It’s also one of the books where the footnotes are struggling to become a book in their own right. It’s like watching one of those DVD movies where the director keeps interrupting the film every 30 seconds to spend two minutes discussing why he adopted a particular camera shot. However, although the footnotes can almost swallow entire pages, leaving some of them with only three lines for the main text, some of the most interesting anecdotes are contained within them. They’re well worth reading. But now I’ve read it once, it will entail further study to try to disentangle all of these parallel ideas. It would’ve been much harder for Professor Hoppe to write, but I hope if he puts this hand-grenade of a book into a second edition, he tries to blend the anecdotes into the text and leaves the footnotes purely for references. Even so, despite this dual-book nature, and the numerous repetitions, this book is an explosive monster, and one which ought to be read alike by every serious libertarian, Chicagoan, Austrian, Minarchist, Randite, or plain mad-eyed-staring lunatic.